Before you begin, use this handy calculator from ZOMBIETRONIX to help you determine the various PVC lengths you'll need (ie: upper arm, lower arm, shoulder width, backbone, etc.) This will keep your frame in proportion and will also prevent you from having to make additional cuts later on to adjust the look. 1) Start at the "neck" area. Use a 3/4" 4-way cross connector. From the top of the cross, attach a short piece of 3/4" PVC. This is where you attach the head. I use the standard Styrofoam wig heads, they fit perfect. 2) From the sides of the cross connector, attach 2 pieces of PVC to form the "collar bones". At the end of the "collar bones", attach a 3/4" 90 degree joint. This forms the "shoulders". 3) From the bottom of the cross, attach a length of 1" PVC for the "spine". I opted to go up in size to the 1" PVC for the "spine" and "legs" because I found that the 3/4" tended to bow a bit in longer lengths. Use a 1" to 3/4" adapter to connect the "spine" to the cross connector. It just slips on the top on the 1" PVC and will then fit into the bottom of the cross. 4) At the bottom of the "spine", attach a 1" 3-way "T" connector. From the sides of the "T" connector, attach 2 pieces of 1" PVC to form the "pelvis". A the end of the pieces, use 1" 90 degree joints to form the "hips". 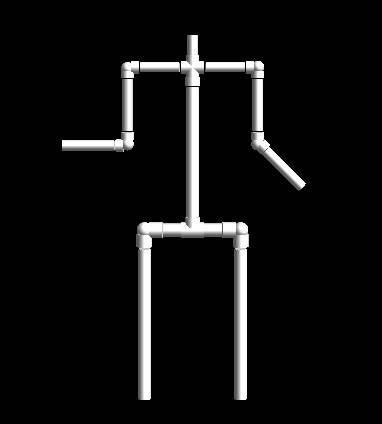 5) To complete the "arms" and "legs", continue adding 3/4" or 1" PVC from the "shoulder" and "hip" joints. 6) To fill out the figure, I bought a roll of foam rubber from a discount store. I cut pieces out and rolled them around each section of the "arms", "shoulders", "legs" etc. The foam attaches easy with duct tape. The wrapping tension of the tape will allow for contouring of the limbs. For the main body, I cut out a "torso" shape from plywood. I attached it to the "spine" with screws. This gives more of a base to wrap the foam around instead of just the PVC, plus it saves having to use alot of it. 7) To make the figure stand, cut 2 pieces of heavy 2x10 wood about 18" long. Get some old shoes or boots and attach them to the pieces of wood, easily done with screws from the bottom side of the wood and then up through into the heel and toe of the shoes. Screw a 1" end cap inside the shoe at the heel area and then slip the ends of the "legs" into the caps. The weight is sufficient to stabilize the prop, although you may need to add some weight onto the stands if the prop is going to be outdoors and subjected to wind. TIPS: I found that it wasn't necessary to glue all of the connections, especially in the "arms" and "shoulders". The joints are pretty snug and leaving them detachable allows for some posing and easy assembly when dressing the figure. You will want to glue the "pelvis", 3-way T connector and "hip" joints to prevent the figure from falling forward or backward. Just make sure it's postioned where you want it because the PVC glue sticks FAST.